Let me make one thing perfectly clear: I am not Ricky Ritzel’s mother, Bubby or press agent. I’m just someone who can’t stop kvelling over his monthly commentaries on Broadway’s musicals especially when Ricky includes terrific songs from flops that closed before the news of their existence reached Philadelphia, where I spent my formative years. Happily, Ricky’s September installment covered four shows during a five year span: from 1968’s The Happy Time to 1974’s Mack and Mabel and 1991’s Miss Saigon and finally 2002’s Hairspray. What about the 1980’s? “Who remembers the ‘80’s?” sez Ricky. 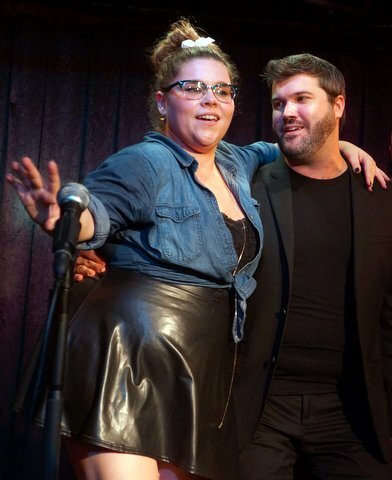 Ricky’s cast has grown to 10 performers, all having the time of their lives, with five adaptable regulars: Ricky himself commenting at the keyboard; buttery-voiced Christina Aranda; iconic ex-Loungaleer Aaron Morishita; Cabaret impresario Sidney Myer; versatile Allison Nusbaum and Kickstarter-funded Jon Satrom plus these newbies: Metrostar finalist Tommy J. 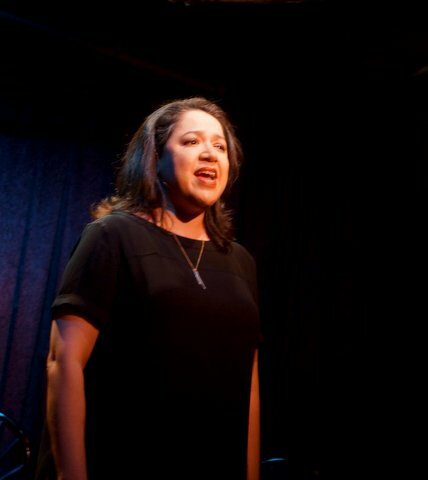 Dose; Brandy’s Sean Bernardi; Mac nominee KJ Morton and former Florida teen Michelle Dowdy who played Tracy Turnblad on land, sea and now at Mama’s. Mack and Mabel, the opening musical, had excellent prospects thanks to a score by Jerry Herman, composer of monster moneymakers Hello Dolly and Auntie Mame and Multi-Tony Award winner Gower Champion as choreographer and director. But there were problems and most of them involved the letter “P” – – Producer David Merrick spent no money on advertising and never saw the show. The plot depicted the tumultuous relationship between two unlovable characters — Mack Sennett – the slapstick-loving silent filmmaker who created the Keystone Kops, the Sennett Bathing Beauties and transformed a Brooklyn Deli waitress into Hollywood superstar Mabel Normand. Robert Preston’s Sennett was too old for Bernadette Peters’ Mabel, the chemistry between them was non-existent and their story lacked a happy ending because Mabel replaced Mack with a heroin addiction and died of TB at 37. Nevertheless, Jerry Herman felt the score was the best he’d ever written. I do too. It’s lively and moving and it’s the only CD that keeps my husband’s eyes on the road during long distance auto trips. Ricky embraced his inner innovator and,wearing his-homage-to-Elaine-Stritch white shirt, became Mack Sennett reminiscing about his past under flickering overhead lights . . .
Movies were movies were movies, when I ran the show! Time heals everything, But loving you. Musical #2,The Happy Time was another Merrick manipulated mess. Despite a lively score by Kander and Ebb, Tony Award winning direction and choreography by Gower Champion and Robert Goulet’s Tony winning return to Broadway. Critics admired the performances but noted large deficiencies in the script that Merrick and playwright N. Richard Nash had mucked up. The Happy Time unhappily closed after 286 sparsely attended performances. It’s claim to fame? Being the first Broadway musical to lose a million bucks. In RRB#3, the score scored with Tommy J. Dose singling “I Don’t Remember You.” Sidney Myer becoming the lad who described himself as “The Life of the Party,” and then aging into Grandpa telling his grandson about “A Certain Girl,” who “will come along, swishing her skirt.” Sidney’s delivery of that line brought down the house! He takes me to New York. He gives me dollar bills. Equally compelling was Alison Nusbaum as the GI’s American bride finally laying eyes on the woman who was the mother of her husband’s child, realizing “Now That I’ve Seen Her,” she’s more than a name. Miss Saigon caused considerable controversy when Jonathan Pryce, a Welshman, snared the role of the Asian narrator. Ricky has returned the totally cynical “American Dream,” to Asian American, Aaron Morishita, who describes the narrator’s work history starting with “selling your mom is a wrench, perfume can cover a stench,” as what he learned from the French. Fun finally took over again with Hairspray, which leaves anyone who saw it leave humming one of its memorable tunes. Ricky’s company did themselves proud, especially Michelle Dowdy who actually played Tracy Turnblad professionally, belting out and hopping to the 1960-ish Marc Shaiman and Scott Wittman dance rhythm and blues. 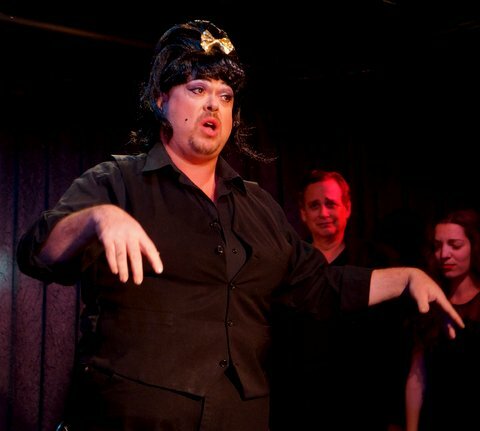 The play was based on John Waters indie film of the same name about a plump Baltimore teenager’s dream of dancing on local TV. Tracy not only becomes an overnight celebrity, she wins the heart of the DJ, launches a campaign to integrate the show and rights injustices in American society. 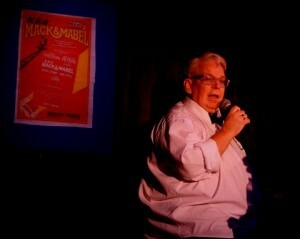 The Rickettes sang their hearts out on 5 upbeat songs from the show. One performer actually deserves special mention. Sean Bernardi in his Borough Park Sabbath Sheitl (wig) and moustache, playing Tracy’s Mom, was adorable. “You Can’t Stop the Beat,” ended the evening with a bang. 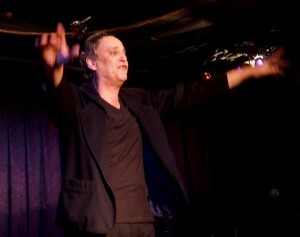 I can hardly wait till Ricky does it again on Sunday October 4th at 8 PM at Don’t Tell Mama. What shows will he strip or cover? Only time will tell.